A caffeinated journey through the streets of Manhattan. Today I felt like trekking on down to the West Village. One of my favorite neighborhoods and former residence — briefly, but still. I walked from Washington Square Park and cut southwest through the trendy portion and touristy areas. Where I ended up was the Starbucks on Hudson Street near Charlton. This portion of the Village is sometimes referred to as the Far West Village, and is a small business enclave within the neighborhood. If I couldn’t tell that by the well-sized business buildings, strategically placed lunch stops, and rushed footsteps hurrying the opposite direction from where I headed, it was made apparent by this location’s business hours. It’s closes at 8pm each weeknight and is not open at all on Saturdays and Sundays. I was shocked at first. I mean, this location is large and beautiful. But who would be here to enjoy it on the weekends? Practically no body is here to enjoy it right now. Just like the Starbucks in the Financial District, there’s nobody that wants to stick around after working a full day’s work. If they need a pick-me-up after work, they’ll run in, but staying open past 8pm would be a poor business decision. So here I thought I’d discovered my new weekend get-away to come and work on my computer in a large, vacant Starbucks, when all I really found was a tease. Still, its size, outlet availability, and the fact that it has two restrooms makes this a better location then most. 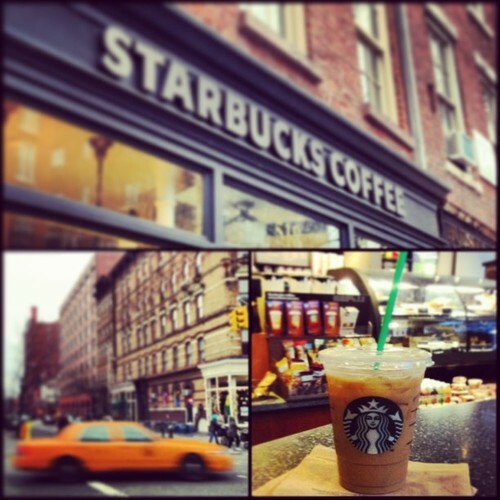 The Starbucks on 14th & 6th straddles the West Village to the south and Chelsea to the northeast. Although these are two of my favorite neighborhoods in the city, neither this block nor this location takes on any of their admirable characteristics. This isn’t a “bad” location by any means — it’s just crowded and condensed. Besides the fact that 14th street brings a lot of pedestrian traffic, it’s also right off of the F/M trains. Fortunately, this location is just a 10 minute walk from several great attractions, including: the Chelsea Market, Union Square, Washington Square Park, and the Meatpacking District. One notable characteristic is that the restroom is slightly hidden. There’s no signage for it, and it’s behind a door with a keypad-handle. It opens right up to reveal a small hallway with the typical gender-neutral restroom at the other end. Unless you’re curious-by-nature or inquisitive, you may miss it entirely. Today I decided to try out Starbucks’ Clover machine on an iced coffee. In case you haven’t heard of the Clover, it’s this coffee pressing contraption that is only available at select Starbucks locations. Like a traditional coffee press, it uses heat and pressure to extract the rich flavor from roasted coffee grounds. You can request to get most coffee based drinks with the Clover, and it really enhances the taste of the bean. My iced coffee was made with the Starbucks Kenya roast, and I have to say it beats the hell out of a regular iced coffee from Starbucks. I usually drink my grande iced coffee with 2 Splenda,but only needed one for this guy. If you haven’t tried the Clover, I highly recommend it. You can use your Starbucks app to figure out which stores offer it and which don’t. The Starbucks on Greenwich & 8th Avenue is just as impressive as the Clover. As far as design is concerned, it’s one of the best in the city. The exterior is nothing but glass panels that round out the street corner instead of creating a sharp angle. The interior has a dark wood theme throughout and large concrete columns with wooden shelves and seating arrangements built into them. Although it’s not the biggest location, and outlet availability could be better, this Starbucks makes up for it with style alone. Tonight I’m back in Greenwich Village. The Starbucks I’m sitting at is directly atop the West 4th Street subway terminal, and it is the Starbucks I met my boyfriend at on our first date. 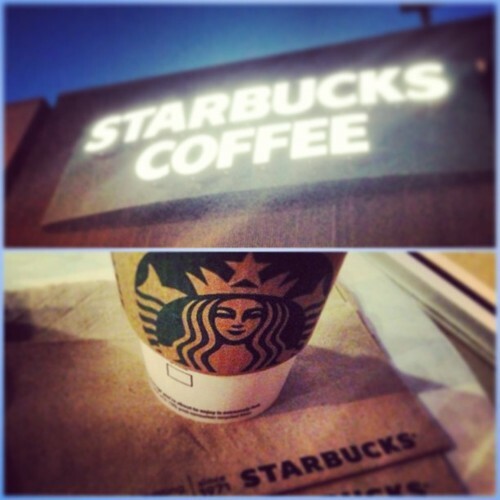 I used to always tell people that I was going to meet the love of my life at Starbucks. It just seemed proper since I spent so much time at Starbucks anyway. I could easily see myself sitting at the crowded cafe, working on a paper or pleasure reading, when a nice young gentleman would ask if the seat next to me is taken. “It’s yours!” I’d say a little too fast. We’d spend the next five minutes stealing glances at each other, and the following two hours getting acquainted and discovering how much we have in common. And the rest would be history. I’m sure many love stories start at Starbucks. Whether it be a chance meeting, a planned coffee-date, or even a little barista-on-barista romance. Especially here in New York City. You never know. The guy or gal you accidentally spill your latte on may be the one that meets you at the alter. Personally, I’d prefer a beach wedding though. 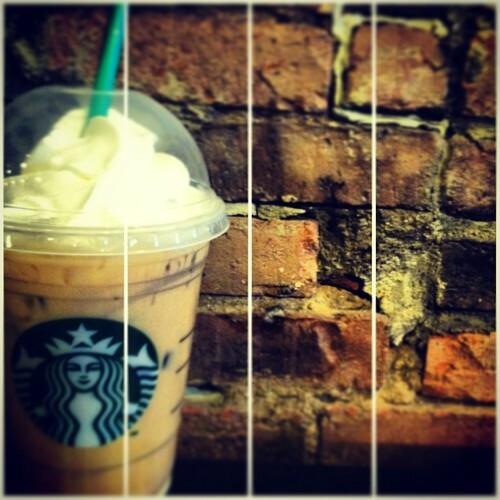 Ever been to a Starbucks that just didn’t… feel right? You couldn’t quite put your finger on it but something was off. It could have been the service, the location, or just a general “vibe” you got. Ever think you may have been at a non-corporate licensed Starbucks? Today I am sitting at one in the heart of New York University (aka Washington Square Park). What’s a licensed Starbucks, you ask? Basically, there are some locations that look like a Starbucks, taste like a Starbucks, and act like a Starbucks — but in fact, they are not. Hotels, universities, airports, and amusement parks are the prime suspects for these licensed stores. Target stores are a prime example. Obviously most consumers cannot tell the difference, and both Starbucks and the business want to keep it that way. 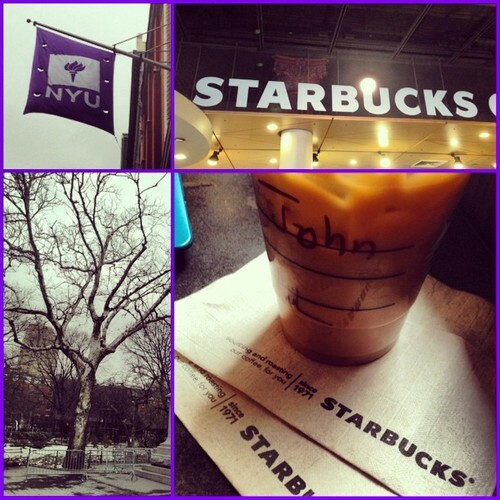 Licensed or corporate owned, this NYU Starbucks has me sold. Simply because it is a gigantic location filled with mostly empty chairs. You could fit 4-5 Midtown Starbucks locations in this space alone. The decor is pretty spot-on with standard Starbucks, and they even have framed black & white pictures of NYC hung throughout. This is definitely a great location for study groups or business meetings, and the fact that it’s in the southeast corner of Washington Square Park is just gravy. Like I said, this Starbucks has me sold, but others may not agree. Since it is NYU owned it may not be as welcoming to those who aren’t students of the university like I am. For instance, it’s WiFi services are through NYU not AT&T — meaning you need a student ID and password to gain access. Also the hours are a major setback. It’s only open until 7pm daily. Do students not study at night anymore? Apparently not past 7pm. Welcome to the West Village — where avenues and streets are of no relevance and the stride of the average New Yorker slows down approximately 2 miles per hour. When I first moved to NYC all of the different “Villages” confused me. West Village — East Village — Greenwich Village — what the hell is the difference?! Now I think I’ve finally straightened it out. Greenwich Village and East Village are two separate neighborhoods — splitting off in the center of Manhattan. The West Village is a smaller neighborhood that encompasses all of Greenwich village west of 7th avenue. And I hope you’re paying attention — there will be a quiz at the end of the year. I have a sweet spot for this particular West Village Starbucks. One reason for this is because it is the closest location to the Christopher Street Piers — which I frequented over the summer. But mainly because on my first week in NYC I sat down at this location, starred out into the streets of my new home, and wrote postcards to some of my dear friends and family back home. I know: how stereotypical! The point is that this Starbucks was the perfect location for doing that. Tucked away in the Village, this Starbucks gets much less of a crowd than most. Which is good because it is a small location, and it really couldn’t handle much more. But it has all the necessities and added West Village charm. My favorite feature is the small counter bar that acts as both a seating area and a divider between the barista line and lounge. A great Starbucks to visit on a Sunday afternoon. And bring a postcard or journal while you’re at it. Today happens to be my birthday. So naturally, I went to Starbucks to cash in on my Free Birthday Drink. The free drink I receive each February 7th is one of my favorite perks of being such a Starbucks enthusiast, and since my birthday, I figured why not treat myself and go to one of my favorite neighborhoods in the city: Greenwich Village. The Village is an area I can retreat to whenever bustling life in Hell’s Kitchen is wearing me out. The low buildings can create a calming — almost suburban — effect, and there are dozens of cafes, restaurants, and outdoor parks to wander through. From the entrance of this Starbucks, I can stare right into the famous Stonewall Inn, where the Stonewall Riots of ’69 sparked the gay rights movement and gay pride into history. Or I can take a short stroll west and find myself at the Christopher Street piers — but I’ll probably wait for the temperature to pick up again before I venture that way. Right off the 1-Train, this Starbucks was always a dependable stop-and-go location when I lived in the area for a short 2-month spell. However, I never really found myself coming here for work or pleasure reading because of the simple fact that it was always crowded. I’d meet a friend here, we’d grab a coffee, then go to Washington Square Park or any of the other scenic areas that the Village has to offer. So you may not be afforded a seat at this location, but Greenwich Village is hospitable enough to house you anywhere. 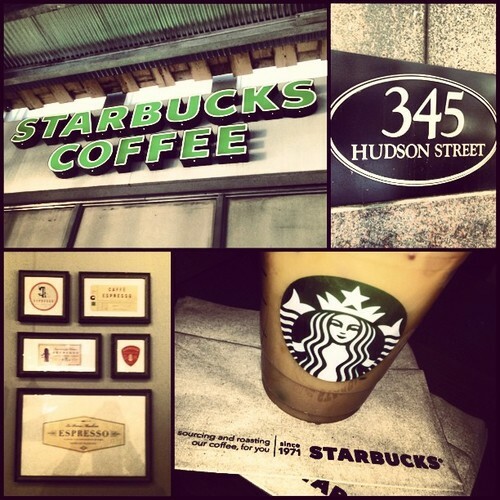 As a gay man, Starbucks enthusiast, and aspiring New Yorker, I’m telling you that this is a must see Starbucks. 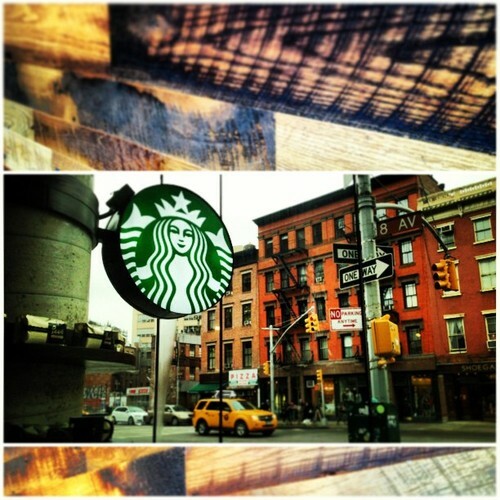 Tucked away between 7th and 8th avenue, this Greenwich Village Starbucks has become one of my favorites in Manhattan. Whereas most locations in the city seem to sweep you in then urge you out, this little gem almost begs you to stay. Location is key here. Not being on a main avenue and not directly in the path of any trains, you almost have to go looking for this one to find it. Surrounded by neighboring restaurants that boast brunch specials and an Equinox to get your fitness-fix, this Starbucks offers a treat for all. It’s larger-than-most sitting area features a window bar, tables-for-two, a large group table, and… YES!.. even some comfy chairs that most Starbucks seem to have excommunicated from their premises. So whether you’re bringing a great read, a good friend, or a tireless assignment this Starbucks has a seat for you. 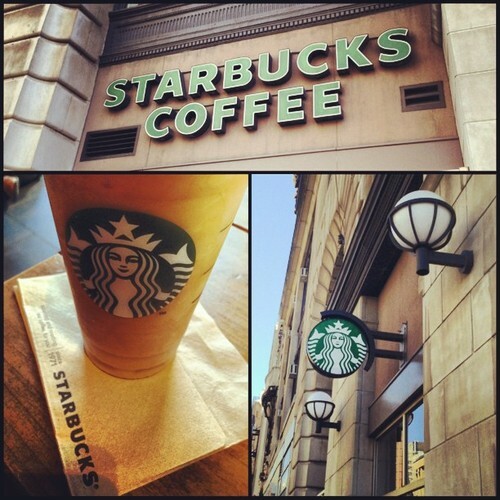 Enter your email address to follow Starbucks and the City and receive notifications of new posts by email.